Though the minimalist fever has marginally simmered down since the height of its Twitter-trending popularity, the movement certainly hasn’t disappeared altogether. 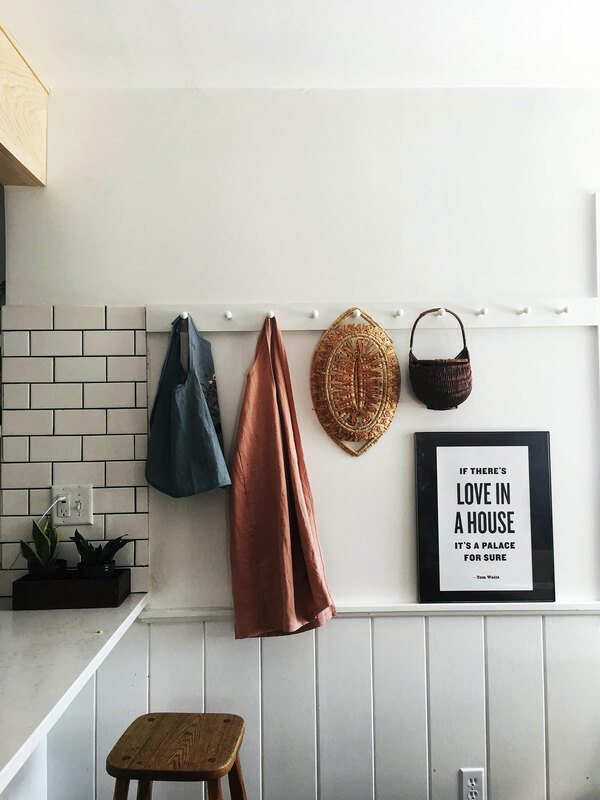 Perhaps that’s because minimalism—despite the seemingly endless feed of Instagram profiles and Pinterest boards dedicated to the aesthetically pleasing nature of minimalist decorating and style—is more than just a fashion statement or a chance to admire that white shiplap eye-candy. Indeed, many a social scientist has made the case that minimalism is a response to the issues plaguing our planet, particularly amidst a materialistic society that is quickly outgrowing the Earth’s natural ability to preserve harmony between man and nature. Still, as the popularity of the movement has stabilized—moving away from “trend” status and establishing itself as more of a societal niche—defining minimalism isn’t as clear-cut as one might think. Take two families living out their own minimalist lifestyles in Northwest Indiana: Steve and Susan Trask, and Will and Jewel Johnson. Both of these families live with very few possessions inside simple homes that celebrate the history and architecture of the house. They homeschool their children, utilizing nature, reading and writing as important teaching tools, alongside experience-focused opportunities for discovery and creativity such as chicken-raising, bird-dissecting, and fossil-hunting. Perhaps most importantly, both families abide by their commitment to experiences and human connection over materialism and hectic day-to-day lives. Yet, each family is unique in their outward expression of minimalism, as is immediately apparent on their respective Instagram profiles. The Trasks (@suest_), a family of six with their four children aged between seven months and seven years, manage to balance their minimalist lifestyle in an urban Crown Point environment, raising chickens in the backyard. The Johnsons (@this_simple_life and @simple_life_at_home), a family of five with three children aged between four and nine years, own a stripped-down farmhouse in rural Goshen, and are rarely seen wearing clothing that isn’t black or grey. Still, apart from the entrancing photos on their Instagram feeds—each of which speaks a thousand words to what their respective minimalist lifestyle looks like on a day-to-day basis—the question that lingers in many a follower’s mind is simply: Why? We sat down with these two families to draw closer to the answer, as well as probe what the Average Joe might have to gain from taking on small aspects of a minimalist lifestyle. How would you define leading a minimal lifestyle? Johnsons: To us, minimalism is simply focusing on the things you really love, and ditching the rest. Even regarding those things we love, we make sure we don’t have an unhealthy amount. That may be possessions. It’s also time, and making an effort to balance a schedule that isn’t so busy. It’s even emotional energy, like focusing on the people that we really care about, and letting go of toxic relationships. To us, minimalism is simply focusing on the things you really love, and ditching the rest. Trasks:For us, leading a minimal lifestyle means living with simple intention. Intention in what we bring into our home, into our bodies, and into our head space. We aim to seek simple moments by forgoing a busy schedule, and leaving space for spontaneity, plenty of free play, and availability to be of service to our family, friends and community. When did you begin your journey toward minimalism? Johnsons: Living in a rural community, in addition to our faith, we already sort of had ties to simplicity. But we still had a lot of junk when we got married, and we tried to keep up with other couples and how they were living and decorating their houses. It was still DIY and simple, but it wasn’t restful. We went through a difficult financial time as well, and that experience really opened our eyes to how much material items negatively affected our lives. So we got on Craigslist, sold basically everything, bought a farmhouse, and made a change. Trasks: Around seven years ago, we picked up a book from a local secondhand shop with a bunch of essays on voluntary simple living. Much of the book was written as a response to environmental and social concerns, but it also placed an emphasis on fostering community and faithfulness to God. After reading the book, we began gardening and backyard chicken-keeping, and it all evolved from there. What are some specific aspects of your day-to-day lifestyle that might be particularly different from the average person’s? Johnsons: One big aspect is really just our farmhouse. When we made the commitment to minimalism, we wanted to use our creativity in place of money. We used that philosophy in renovating our farmhouse, and exposing the interior to celebrate the simple and natural design of it. The whole farmhouse was really designed around this wood-cook stove we bought on eBay for maybe three hundred bucks. And sometimes in the winter mornings, it’s pretty cold in the house. But cutting the wood, feeding the fire, heating up the house, grinding your coffee and cooking food over the stove is something special. It draws the whole family around it, and we’re all together. Trasks: We make an effort to start our days unhurried. Our morning rituals linger and our day unfolds slowly. We home-educate our children, but our day doesn’t resemble typical classroom activities. We lead our children towards self education, which is done through direct contact with the best books, poetry, art and music. Keeping urban chickens has taught our kids about responsibility, sustainability and compassion towards animals. Our days have a lot of unstructured time and our kids’ creativity thrives on that. We also love living in downtown Crown Point, where we can walk to city events, numerous parks, the library, shops and the grocery store. What do you love most about minimalism? What do you love least, or even hate? Johnsons: One of the challenges can be trying to explain our family decisions to someone who doesn’t understand—or doesn’t want to understand—our lifestyle. Like trying to explain that we don’t really do a lot of presents for our kids for Christmas, and that makes us come across as monsters. And when we try to explain that we substitute things with experiences, it might sound condescending. But something that we love about minimalism is that it allows us to be creative for everything, including for holidays. Like for Christmas, we put books on hold at the library, and we wrapped these huge stacks of books, and every day our kids opened a new book and they loved it. Trasks: On a practical level I love how minimalism in design looks visually. With six people in the house there is a lot of unavoidable “stuff” happening. But organizing them in a beautiful way like thrifted baskets for art supplies, old canvas bags for laundry, reused glass bottles to store oatmeal and soap, it all makes us happy. I don’t think we like how the idea of minimalism can seem all or nothing. There are things that can be simplified in everyone’s life. But that doesn’t mean people need to stress over, or feel bad about the things they have. What do you think you and your family have learned or gained from living this lifestyle? Johnsons: I would liken it to a health journey, in that it might be really rewarding to go run five miles every day, but at times it’s also really hard. At the end of the day, I think we’ve become experience-focused rather than possession-focused. Most of our money comes from my [Will’s] job as a freelance photographer and graphic designer. Having that flexibility is great because it allows us to travel and spend time together when we want to. Trasks: On an emotional level, our family has learned that nurturing relationships with people and creation is more fulfilling than consumerism. It’s also taught us to think about sustainability when making purchases. We try to thoughtfully consider what we keep in our home. We recently moved to a house that was built in the early 1940s, and we decided to keep it mostly original, and embrace its craftsmanship, history and simplicity. We look for quality, well-made furniture, and have been able to source all of our furnishings (with the exception of mattresses) from local resales, antique shops, Craigslist and family. What do you think this kind of lifestyle could offer others, either in your hometown region or on a wider scope, perhaps globally? Johnsons: Part of the reason we started our Instagram page was just to be a spark for someone else’s journey. 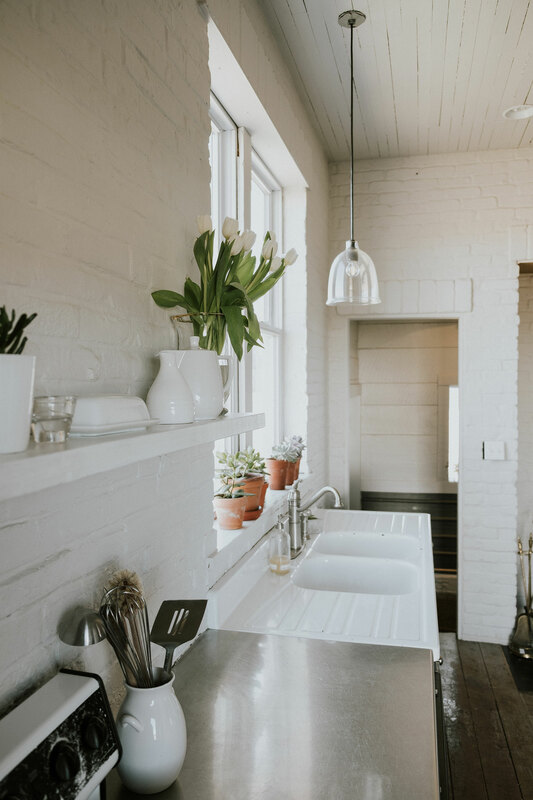 It doesn’t have to be full-fledged minimalism, and there are benefits even for adding a little bit of a minimalist lifestyle to your day-to-day. Learning to have less waste and clutter is a small thing that can make a big difference. We had a meeting at work where everyone took out their wallets and emptied out whatever they didn’t need. Little receipts and garbage and things like that. It was amazing how thin everyone’s wallets were after that. 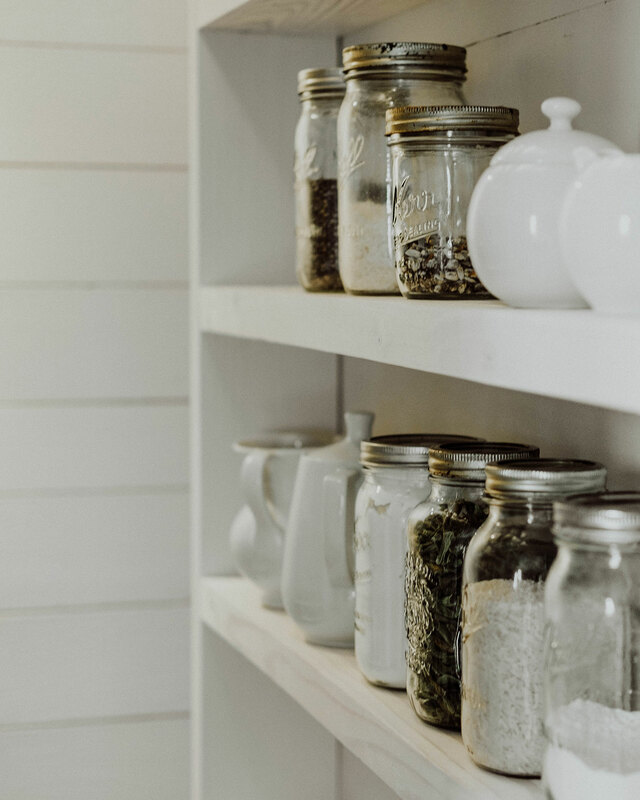 Little mindful actions like that are so freeing, and taking those small steps can lead to having less waste and clutter around the home and in your life. 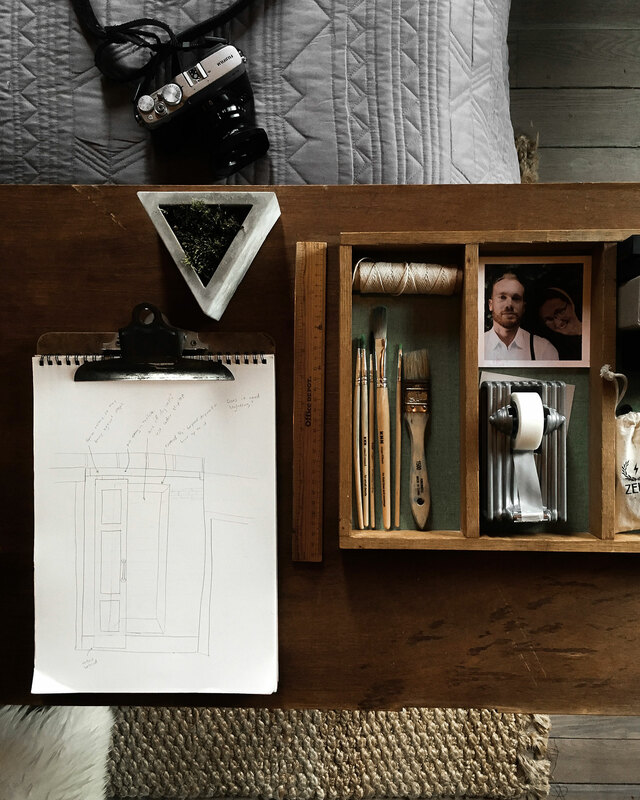 Trasks: I think that a minimal lifestyle can offer people freedom—freedom to simplify their schedules, homes and minds, or maybe just their linen closet. On top of that, there are so many creatives putting out quality products made locally and sustainably here in Northwest Indiana. And little things like using cloth napkins instead of paper, or investing in a water filter instead of buying bottled water, or just living with less in order to increase your charitable giving can all make a big difference on both a small scale and globally. HERE magazine is a quarterly print publication and daily website that celebrates community . . . the people and places that make the northwest corner of Indiana increasingly unique.